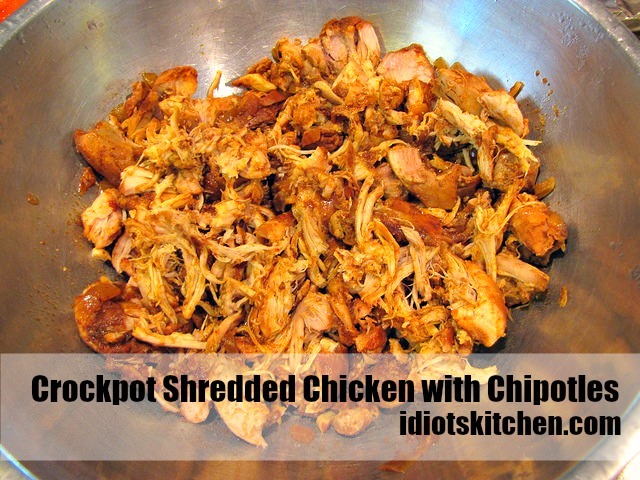 Crockpot Shredded Chicken with Chipotles. Oooh…this is a good one! Super easy because the crockpot or slow cooker does all the work for you. Super simple because it has just a few ingredients that are readily available at any grocery store or that you probably already have at home. 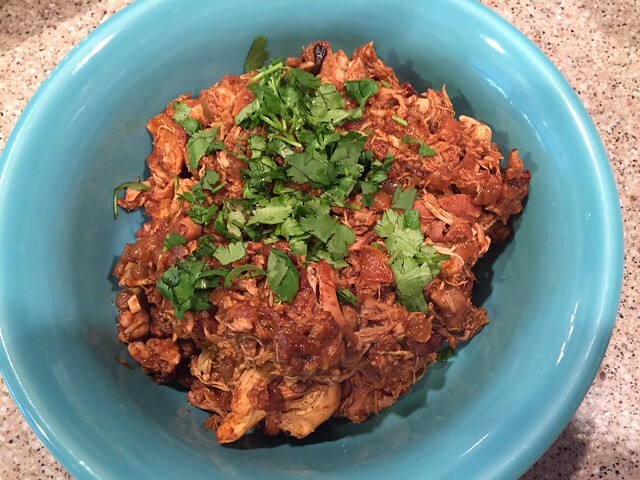 SUPER tasty because chipotles, chicken, and slow cooking are a match made in taste heaven. Even though the cooking time is long, since the crockpot does all the work, I think this definitely qualifies as a Weeknight Wonder! I got this fantastic recipe from my friend Larry in Minneapolis. I stay at his house when I’m playing in the orchestra up north. On my first day there he brought me into the kitchen, opened a bunch of containers from the fridge, and had an impromptu tasting of spicy, smoky, shredded chicken and REALLY good mashed potatoes. I immediately pumped him for information and the recipes and made both when I got back home. The only thing I did differently than Larry was to change the quantities just a bit. 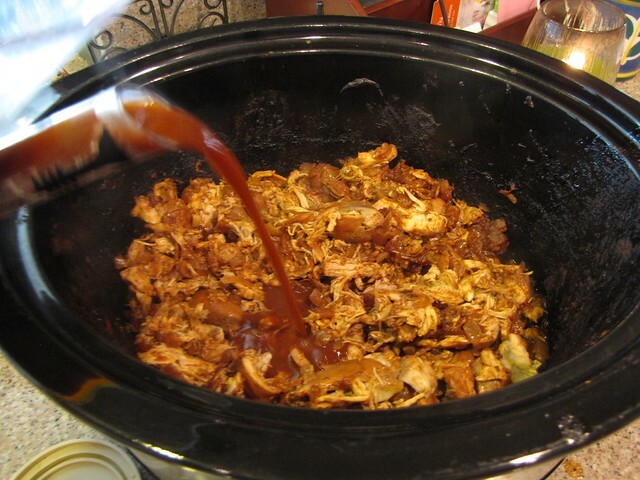 Any time I’m doing something in the slow cooker/crockpot, I want to fill it up so we will have leftovers. 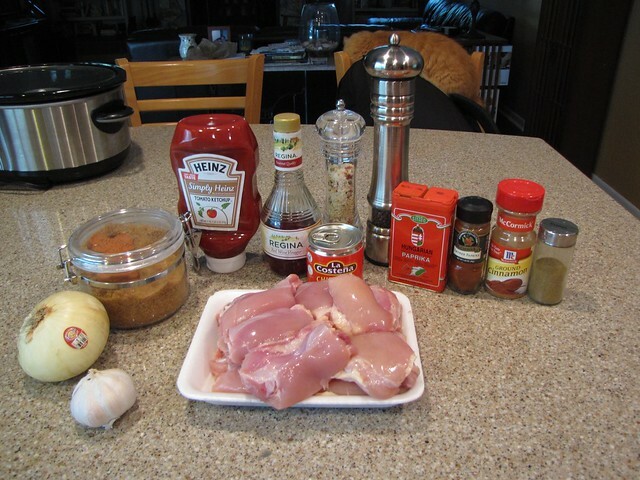 So this recipe is sort of a double batch of chicken…at least 6 servings. 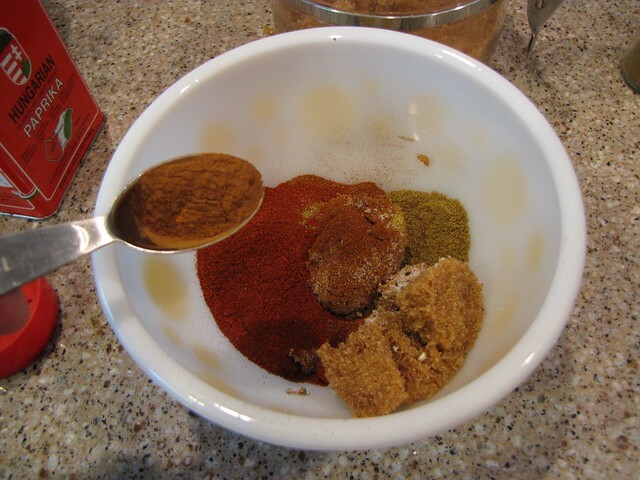 In a small bowl combine 2 Tablespoons brown sugar, 1 Tablespoon paprika, 1 Tablespoon smoked paprika, 2 Tablespoons chili powder, 1 teaspoon cumin, and 1/2 teaspoon cinnamon. Add salt & pepper…about 1 teaspoon each – more or less to taste. Roughly chop 1 large onion and 3-4 cloves of garlic. 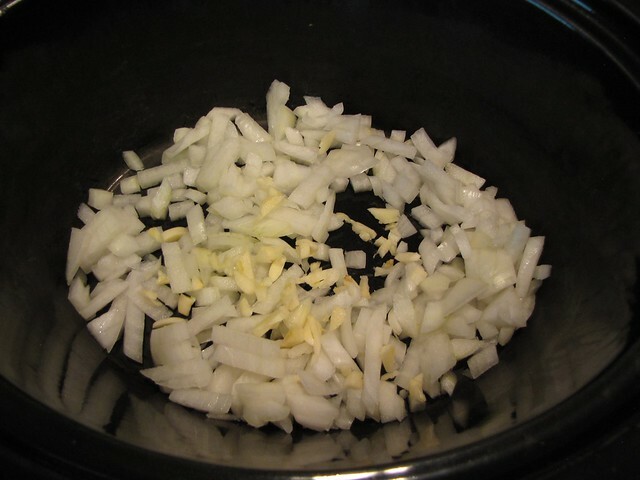 Place the onions and garlic in the bottom of the crockpot insert. 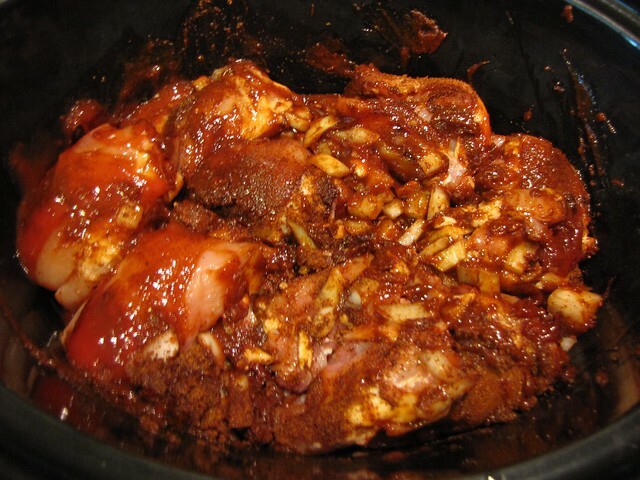 I lightly trimmed any really big chunks of fat away and tossed them in the crockpot. Now you get to decide how spicy you want your chicken to be. 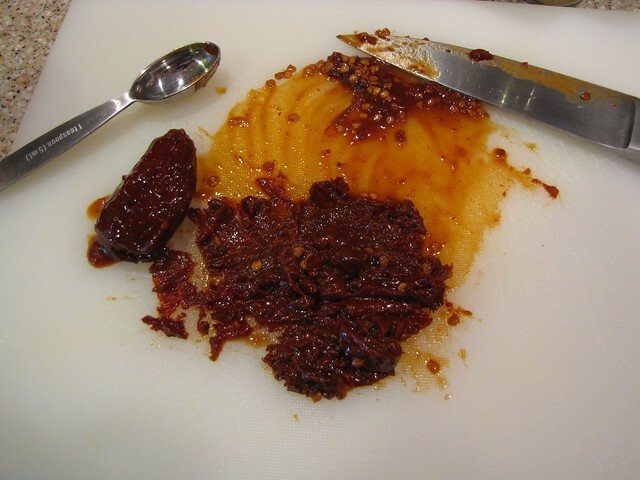 Open a can of chipotle peppers in adobo sauce and remove 1-2 peppers. They might vary in size, sometimes the peppers are really small so I would use 3. Usually I use 2. I also like to cut open the pepper and if there are a ton of seeds, I scrape them out. If there are only a few seeds, I just leave them in. Roughly chop the peppers and add them to the pot. I also like to add a spoonful or two of the adobo sauce from the can. Put any leftover chipotles in the fridge or the freezer for another time. Give the pot a stir to combine the ingredients. It will look like a big mess but don’t worry about that. Set the crockpot on high for 3-4 hours or low for about 6. If you happen to be home, wander by occasionally and give it a stir. 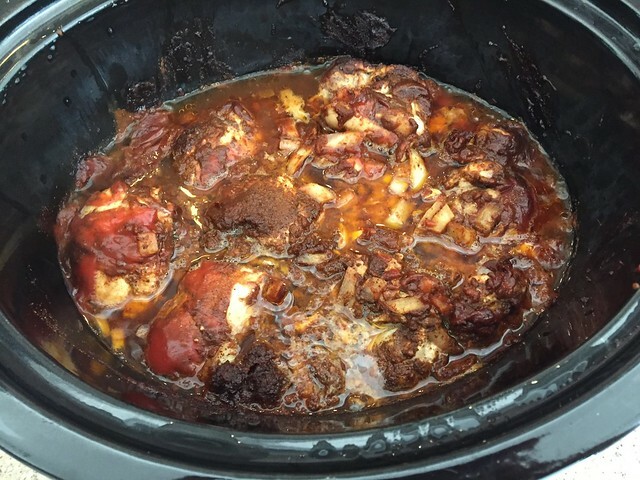 I always use my crockpot out on the patio so my entire back yard smelled SO good! This is done when the chicken is so tender that it is almost falling apart. Take the chicken pieces out of the liquid and let them cool slightly. 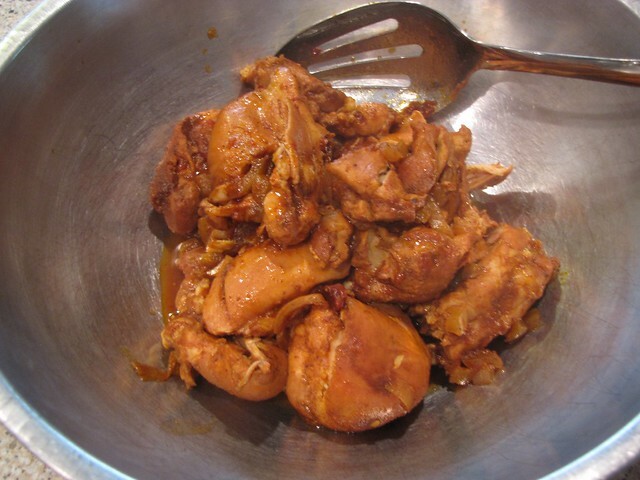 Then use 2 forks or your fingers to gently shred the chicken into big chunks. Don’t forget that sauce! I strained out the solid bits from the juice and added all those good onions and peppers back to the bowl of shredded chicken. Then you can decide how juicy you want your chicken. 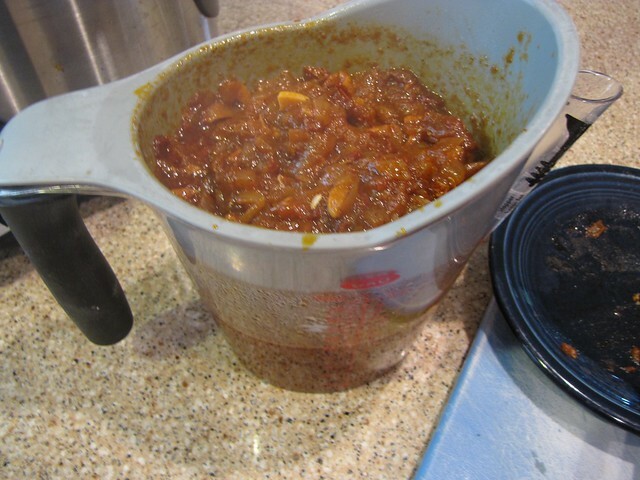 Start adding the cooking liquid back in, give it a stir, and add a bit more until it is as saucy as you’d like. Taste and adjust the seasonings of salt & pepper. Brown shredded meat is hard to capture on film. I tried to pretty it up with some cilantro but don’t let the complete lack of food styling deter you from trying this dish. 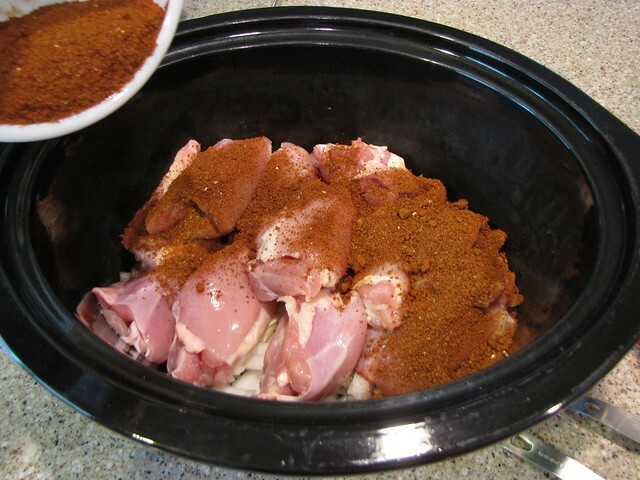 This chicken is SO tender and SO flavorful. As I mentioned before, you could use this as a base for tacos or burritos, use it as a topping for a taco salad, or just eat it on its own. I served mine with Smoky Chipotle Mashed Potatoes a la Larry. That recipe comes tomorrow! If you are not a dark meat person, I’m sure this recipe would work just as well with boneless, skinless chicken breasts. 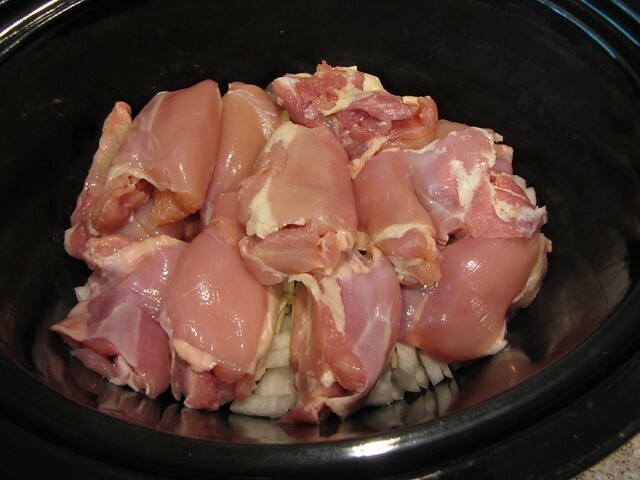 In keeping with our theme of Weeknight Wonders, you could easily prep all of the ingredients for Crockpot Shredded Chicken with Chipotles the night before right in the crockpot liner and pop it in the fridge. The next day, get it all in the slow cooker, set the timer, and go. This has quickly risen to the top of my list of favorite crockpot dishes. Thanks Larry!